While the sordid case of Mumbai socialite Indrani Mukerjea last year —in which she was accused of having killed her own daughter Sheena Bora — created a flurry in social, political and law-enforcement circles, an offshoot of the consequences has served up a bitter pill to the medical fraternity as well. Doctors, who were made to taste food for poison before it was served to Mukerjea in accordance with an archaic practice, while she was being treated at the J J Hospital after her arrest, had been very displeased and submitted a letter of protest to the Directorate of Medical Education and Research (DMER) late in 2015. Now, a few months down the line, DMER has taken cognisance of the missive, saying it is working on an alternative method to do away with this practice that puts lives of resident doctors at threat for VVIPs. Dr Sagar Mundada, state president of the Maharashtra Association of Resident Doctors (MARD), said, "This is a pre-Independence practice. The job is not for doctors — our work is to treat patients, for which we have a specialised education. It is good that DMER has taken note of this and is working towards abolishing the practice. In case of a murder accused, it is as if more importance is being given to the life of a criminal rather than a dignified professional." Dr Pravin Shingare, DMER director, told Mirror, "The practice has been going on for decades and cannot be done away with immediately. We got a letter from the MARD asking us to abolish it. Now, we are working with them to implement an alternative in place of this, where a doctor will not have to taste food to detect poison for a VIP." A proposal in this regard is to be sent to the state health ministry soon. Mukerjea had been admitted to the hospital for a suspected overdose in October 2015, where a resident medical officer had to taste everything she ate. It was only after 10 minutes, when it was established that there was to be no adverse reaction, that she was served the same food. The incident had left the doctors fuming and even considering approaching the state human rights commission. 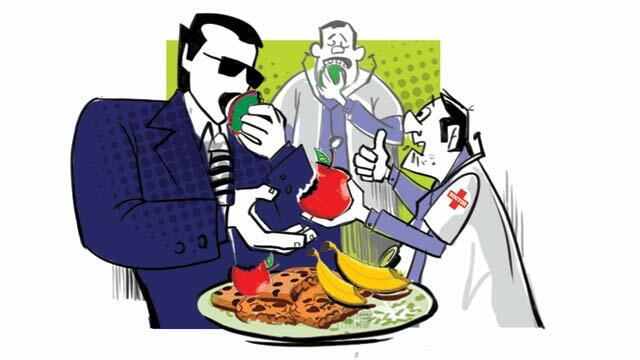 Resident doctors or medical officers at government hospitals have had to taste food for VIPs for decades together now. In its letter, MARD called the practice obsolete and said they wish to do away with it as soon as possible. Interestingly, doctors are suggesting that instead of making them taste the food, a food inspector from the Food and Drug Administration (FDA) could be appointed to do the same, or advances in science could be used to ensure food safety in a less personal manner. Shingare added, "The practice has been listed in protocols since the British era. Doctors had never protested about this before, so it went on. Now that they have objected, it is being addressed. There is no question of serving food to VIPs and VVIPs without tasting, but we have to figure out who will do it." Speaking to Mirror on condition of anonymity, a doctor, who has had to follow this practice, said, "It is very demeaning. We are not guinea pigs for VIPs. Our work is to treat them, for which we are well educated. You can't be treated without respect just because you don't have as much money or power." DMER's move was hailed by Dr Kanharam Patel, president of MARD's Pune Chapter, who said, "We are not subjects to conduct trial and error on. We have always been against this practice." Dr Avinash Bhutkar, president of the Indian Medical Association (IMA) Pune, said, "This is discrimination between two humans — one is dispensable and the other is indispensable. Moreover, some poisons may have a delayed effect, making this practice technically pointless. Doctors are not food experts to taste whether something is not right. They should put some other mechanisms in place instead of this."